I’ve seen so many Vlogs and Blogs recently on how people store their things. I don’t really have a special way of storing things although they are all in 1 room (2 if you count my en-suite which is in my bedroom). 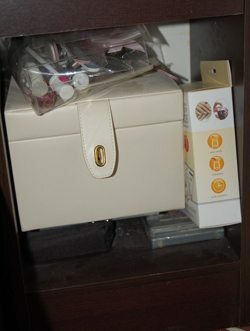 So I thought I’d share with you some of my hair and beauty things and how I store them. Almost MTV crib style LOL Please note this isn’t everything but the ‘most’ used on a regular basis. 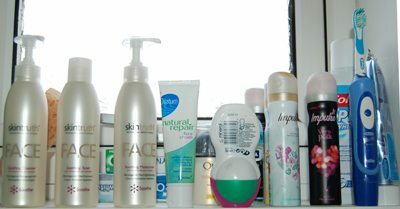 My window cill – Cleanser, Toner, Moisturisers, Deodorants/Body Sprays and Dental. I know many of these things aren’t meant to be in direct sun light but I’ll be honest and say there’s no other places for them and its easier to reach them here. This is just to the left of my sink where I get ready each morning. I think you can see most the products clearly so won’t go into an explanation about them. Brush Storage – Not usually on my sink less in use. This is usually in the 3 tier metal storage thing on the floor (See below) with my spare perfume. 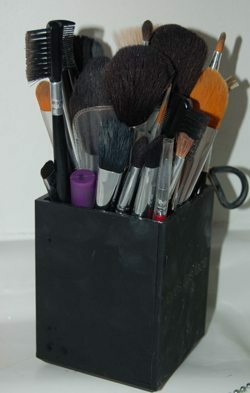 This is an E.L.F brush holder. 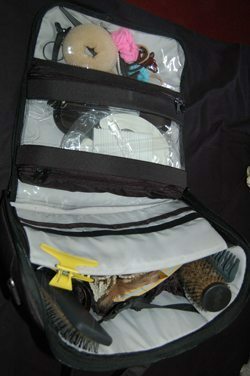 It’s crammed full of my most used brushes. I think there’s a collection of E.L.F, Sigma and random brushes in here. Also my Ruby & Millie eyelash curlers (The other set are at the back and can’t be seen – RED Eyelash Curlers). Here’s my 3 tier metal shelf overflow/extras. Things I use on occasions but not daily. 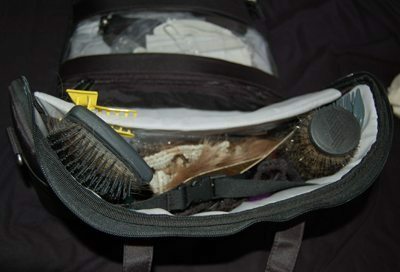 It also contains excess hair products, perfume, usually my makeup brushes less in use, all my false eyelashes and spare makeup bags. 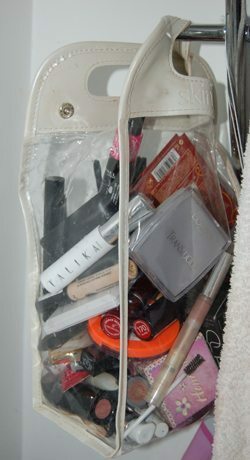 Here’s my overflowing used on a daily basis makeup bag. Most products in here are things that don’t go on the glass shelves (See below). It’s a bit like pic and mix – you never know what you will pull out! Lipsticks, mascara, (some) lipglosses, bronzers, eye liners (Liquid, gel and pencil), lip pencils and blushers (cream and powder). Anything else has probably been put in there by mistake! My 3 tier glass shelf. This is the bottom tier and has my foundations, some bronzers, translucent powder, tinted moisturisers, highlighters, night cream and the Clarins Daily Energizers Set. My 3 tier glass shelf. This is the middle tier where I store my eyeshadow palettes (Sleek, L’Oreal, Chanel, ELF), my foot creams and treatments, some random hand cream which shouldn’t be there and a face treatment (I think this is a face mask as the scrub is in the main bathroom). My favourite shelf. 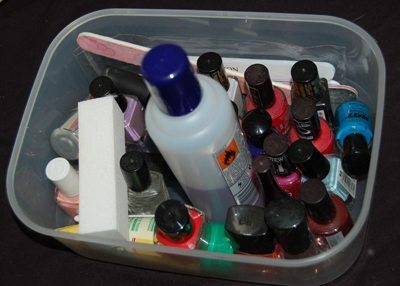 This is the top tier of the glass storage shelving and contains my most used self tanning products. In the FCUK bag there is numerous latex gloves, mits, a headscarf (For covering my hairline if I am spraying); then we have the self tans – No7, Sienna X, Xen-Tan and Fake Bake. 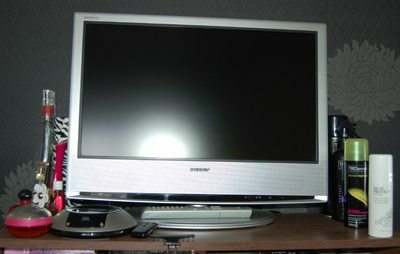 Before the weekend my TV and JBL dock wasn’t on here so have had another move about; to the right we have my perfumes and to the left we have my daily used hair products. This currently sits onto of the bookshelf or wherever it will go. Its just a lunch box (exciting huh!?) of my recently used nail varnishes and my nail remover. There’s also a sanding block, hand cream and a hello kitty file. This is by no means all my nail varnishes, you will see that they are all over the place in my room (And downstairs) but as I said these are the recently used ones. 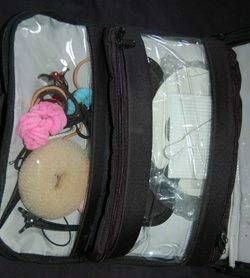 My old kit bag which now contains hair things. I felt they fitted in quite well. In here we have my hairbands, chiggon, sectioning clips, grips, some spare kit things (cotton buds, brushes and palette), paddle brush, wide tooth comb, round styling brush, 2 sets of extensions. This is the bottom section of my bedside table – I’m running out of room to put things can you tell! Here is my nail kit things – clippers, files, orange stocks, glues, tips etc and to the right there’s the Rio Nail System I reviewed yesterday. There’s also my jewellery box which I won’t open as everything falls out! 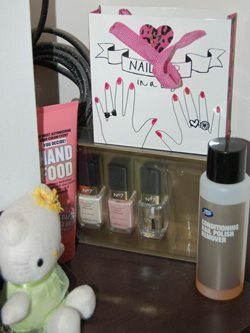 This is the top of my bedside table where I have my No 7 french manicure set, the best nail varnish remover in the world! I swear this Boots nail varnish remover will get off anything (possibly skin too LOL I’m joking but its really strong and takes off topcoat/varnish from gel nails in seconds! ).In the free Nail bag from 17 there’s another 9 nail varnishes that I’ve nowhere to put and not tried yet (Least I don’t think I have). We also have my nightly hand treat of Soap and Glory’s Hand Cream. So that’s how I store everything, its a lot tidier than it was but as I buy more I’m having to find more ways to store it. Next I’m getting a plastic draw storage unit to store things in that can go next to my shower in the en-suite. That should keep me going a bit longer! How do you store your things?